The Internet of Things is now a staple of competitive strategies for both embedded platforms and IT solutions alike. The recent merger of Kontron, a leading global provider of embedded technology, with S&T Deutschland Holding AG (S&T) is critical to the company regaining its foothold in the market. Kontron designs and manufactures embedded boards and systems spanning a swath of form factors. The company is a pioneer in the computer-on-modules market and remained the leading global supplier in 2016. Recent years, though, have not been the healthiest for Kontron, which restructured itself in 2013 in an effort to stymie revenue losses primarily resulting from shrinking government defense budgets, the expiration of long-term transportation contracts, and weak economies in EMEA. However, the merger with S&T can provide Kontron with the extended capabilities needed to capture new design wins from its competitors. Kontron benefits from the merger in several ways. For instance, both organizations have a similar customer base supporting IoT applications. Targeting the same customers allows for easier integration up the value chain with S&T software. In fact, S&T previously purchased some business units from Kontron itself, allowing for smoother integration today of products and corporate culture. S&T also brings vast expertise and support from the IT side for cloud computing and analytics, which will be critical for Kontron – or any embedded technology supplier – to develop impactful Industry 4.0 solutions. The major shareholder of S&T, electronics contract manufacturer Foxconn Technology, is also on hand to extend Kontron’s hardware engineering and production capabilities alongside its subsidiary Ennoconn. There is also a broader channel now for some of Kontron’s newest products, which help fill some gaps in the S&T Group’s portfolio, such as for the FlatClient and FlatView industrial grade panel PCs and monitors. 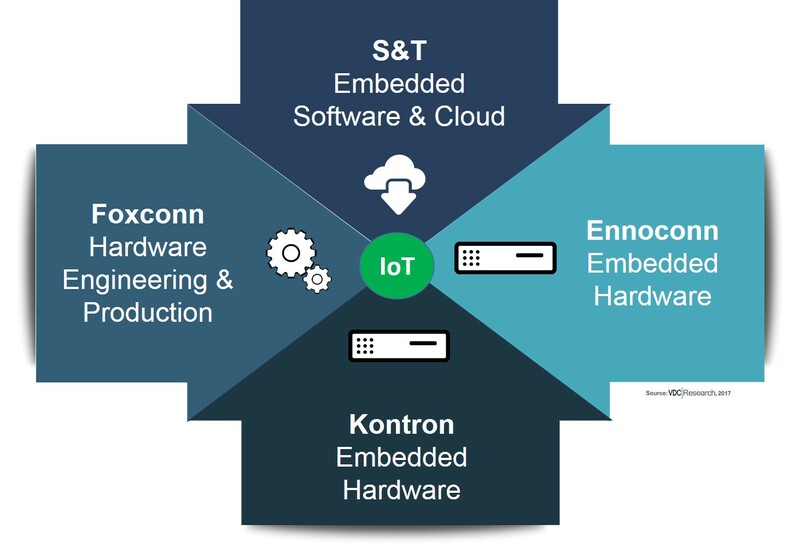 The combination of Kontron, S&T, and Foxconn/Ennoconn has the potential to enable cost-efficient engineering of new connected solutions and take advantage of the IoT movement. While the promise is great, integration of several large organizations is not easy nor quick. There are several risks associated with the merger including an uncertain level of cooperation with Foxconn, divided attention for Kontron supporting traditional embedded applications and standardization groups (as well as the alignment thereof with S&T’s objectives), and the dependence on the eastern European economy. Nonetheless, Kontron was forced to take drastic steps after unsuccessfully reorganizing itself for revenue growth several years ago. With S&T, Kontron is able to better address the convergence of IT and OT worlds in a variety of industrial environments with total solutions, which is increasingly important to their OEM and systems integrator customers. With Kontron, S&T now has the industrial expertise needed to bring IT server functionality onto the shop floor. In time, this merger could very well be the spark Kontron and its customers were looking for to reinvigorate its business outlook and preserve its leadership across several embedded hardware markets. Ngành gỗ Việt Nam: Cơ hội tới... 20 tỷ USD? Mỏ dầu nào “khủng” nhất Việt Nam?